The sidewalk is hot enough that you could fry an egg on it. Heat waves rise up from the road and opening the door to your car is like opening an oven. The summer heat is no joke. But, summer is also often the best opportunity children have to play outdoors. With a free schedule, they can enjoy running around and playing outdoors. It’s hard to justify keeping children inside in the summertime, but the heat is a real concern for many parents. In some areas of the country, the high of the day in August easily tops 100 Fahrenheit. So, how can you help your kids enjoy their outdoor time while staying safe? Sunburn is not only uncomfortable, it puts you at risk for skin cancer. This is especially true for children’s sensitive skin. Make a habit of applying sunscreen early in the day and re-applying frequently, especially if swimming. For older children, you can set a reminder on Picniic for applying sunscreen. In the heat, you need to work harder to stay hydrated. Make sure your child drinks plenty of plain old H2O throughout the day. Juice and sports drinks are fine occasionally, but the bulk of hydration should be through water. How can you encourage drinking water? One of the simplest strategies is to purchase your child their own water bottle. Make sure your child knows how to fill up the bottle on their own and encourage them to drink throughout the day. If your kids don’t like to drink water, you can also offer ice. Sucking on an ice cube offers fluids, but is also pleasant and cool. Don’t be surprised if you find your kids rubbing ice cubes on their arms and legs, though! On that note, you can also keep a few spray bottles outside where your kids play so that they can spritz themselves cool. Running a sprinkler in the yard is another fun activity that will help your kids keep their body temperature lower, even in the summer heat. In areas where the heat index is through the roof during the summer, you may consider limiting time outdoors, or at least limit time in the sun. Typically, the worst of the heat is around mid-day and in the early afternoon. Call your kids indoors or to the shade between 11AM and 3PM. Time indoors is the perfect time to work on summer reading, crafts, have kids help make lunch, and other quieter activities. When the worst of the heat has passed, you can send the kids back out again! While the actual air temperature doesn’t change between the shade and sun, you feel about 10-15 degrees cooler in the shade because you don’t experience solar radiation in the shade. So, shade is good! Avoid overheating by having your kids play under the shade of a porch or tree. If you can’t keep your kids in the shade, you can use a number of alternatives. 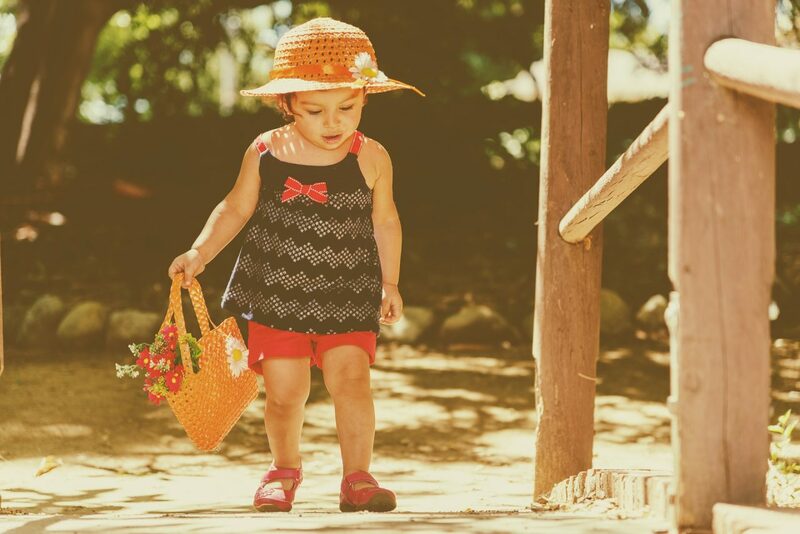 Opt for wide-brimmed hats or baseball caps to keep the sun off your child’s face. You can also make a fun activity out of creating shade. Hang a clothesline somewhere in your backyard and help your kids make a tent with a large sheet. Chances are your kids will be enchanted by the idea of hanging out in the shade of the tent. Dehydration: Fatigue, dry lips, thirst, and feeling overheated are the main signs. However, keep in mind that if your child mentions that they’re thirsty, they’re already dehydrated. Encourage your child to drink water and take a break. You can also check your child’s hydration level in their urine. Darker colored urine indicates dehydration. Your child may also urinate less frequently, also indicating dehydration. Heat Cramps: If your child complains of abdominal, leg or arm cramps or pain, this may be a result of dehydration left untreated. Make sure your child rests in the shade and gets some water. Heat Exhaustion: Also a result of dehydration and overheating unchecked, your child may feel nauseous, vomit, feel dizzy, experience muscle pain, get a headache or even fall unconscious. The best treatment is rest and water in a cool place. If your child’s symptoms are severe, seek medical attention immediately. Heat Stroke: The most serious heat illness, the symptoms of heat stroke are severe. Some symptoms include a high fever, nausea and vomiting, delirium, absence of sweating, seizures, unconsciousness, and shallow breathing, among others. These symptoms require immediate medical attention at the hospital. With these strategies, you can make sure that your kids stay safe even in the heat! Summer can be a wonderful time to enjoy the outdoors, as long as everyone is safe. A little bit of prevention and planning go a long way to making sure your kids can enjoy the long summer days. Do you have tips or tricks for keeping your kids safe even in the heat? Tell us about them in the comments below.